On November 18, Captain John Mason, PGA and Coach Jackie DeWald-Mason led Team California from Encinitas Ranch Golf Course to become champions of the 2018 PGA Jr. League National Championship presented by National Car Rental at Grayhawk Golf Club in Scottsdale, Arizona. The team of 10 went undefeated (6-0-0 Record, 49.5 points) and captured the team’s second nationwide title and fifth for California. Mason previously led his 13-and-younger division team to win the 2015 Championship at Disney’s Palm Course in Lake Buena Vista, Florida. California team member Jay Leng, Jr., 13, was the sole returning competitor to the current team. His teammate Karen Tsuru was just 10-years-old when her older brother, Daina Tsuru, helped California win the title three years ago. Now, she has a title and a trophy too. Over the nine-month journey, Mason’s fundamental teaching tips included instructing his players to have fun and get birdies. Inspired to help kids get going in the right direction and have fun with golf, Mason started coaching the PGA Jr. League in 2012. 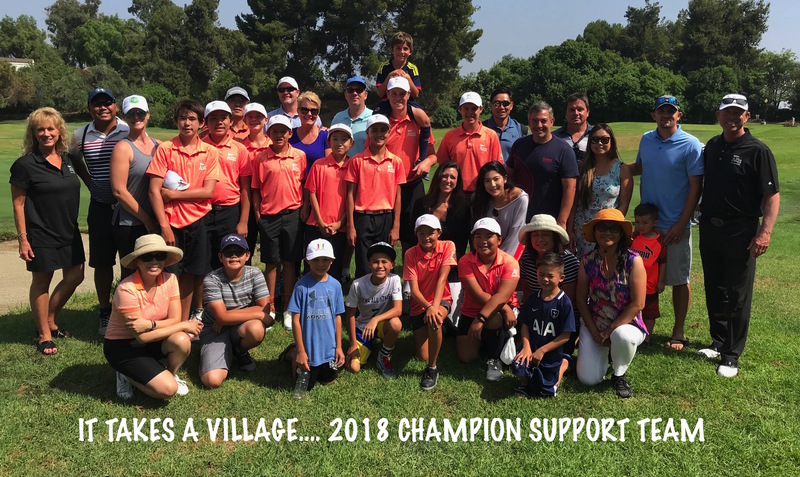 Since then, the league has grown substantially to more than 50,000 participants on 4,200 PGA Jr. League teams nationwide. The championship celebration continued as Team California and their coaches were special invited guests and recognized at the Global TaylorMade Launch on November 28. Next they will be recognized at the SCPGA Annual meeting December 10th and have the opportunity to play Wilshire Country Club. 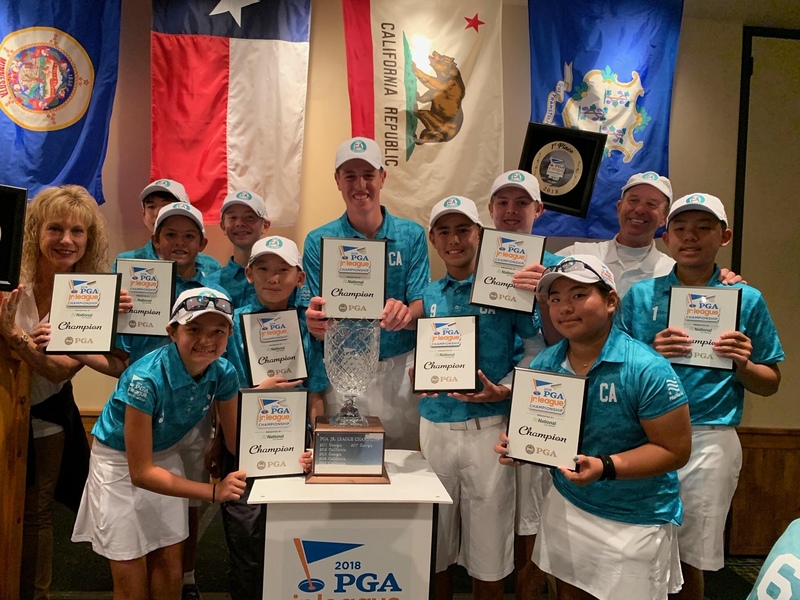 Team California member, Karen Tsuru won the Toyota Tour Cup Championship for girls 12-19 years old. Jay Leng Jr. won the 8-9 year old male DCP in 2015 and now qualified for the finals of 2019 DCP. 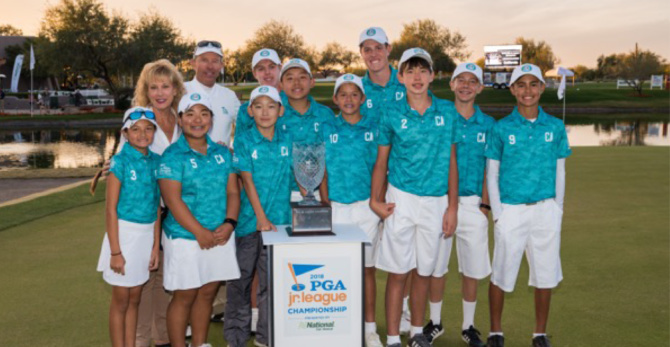 Each of the last two years, PGA REACH, Grayhawk Golf Club and National Car Rental have worked together with Golf Channel to air a two-hour, prime-time special highlighting the event. This year’s show will debut on Dec. 4, airing at 8 p.m. ET/5 p.m. PT and 12:30 a.m. ET/9:30 p.m. PT. In the top photo, the back row features Coach Jackie DeWald-Mason, Captain John Mason, Phillip Kench, Darren Ho, Matthew Broder. The front row features Jasmine Kahler, Karen Tsuru, Jay Leng Jr. Zander Grant, James Whitworth, Nathan Moore and Ryan Abuan.